BY DAVE DUNPHY WHILE AT HFS, INC.
Brief: The overall goal with the complete redesign of this last remaining original food and beverage outlet within this existing premium business hotel was to infuse the restaurant w/ contemporary interpretations of the traditional arts found in Chinese culture while reinforcing the principles of Feng Shui. Concept: Primary amongst the various artistic expressions used to infuse the design of the restaurant with contemporary interpretations of traditional Chinese arts would be Chinese opera masks, the art of traditional Chinese paper cut with its very graphic qualities, and the Tai Hu, or Spirit Rocks. 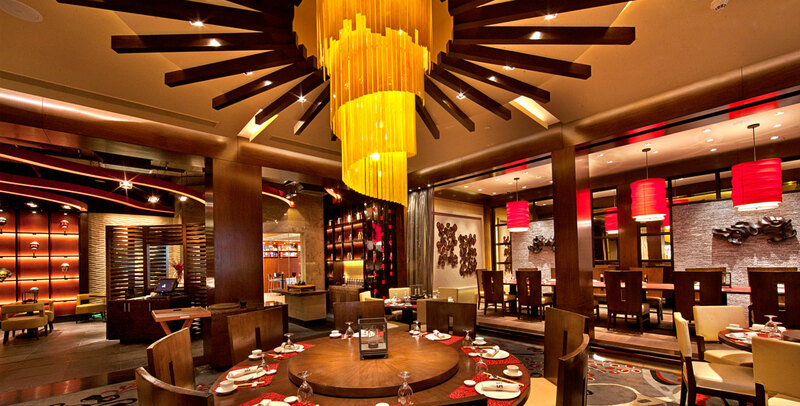 The principal organizing element within the restaurant is a contemporary interpretation of a Chinese parasol with a dramatic central chandelier emerging through the ceiling over a large table for eight resting upon a central carpeted area. 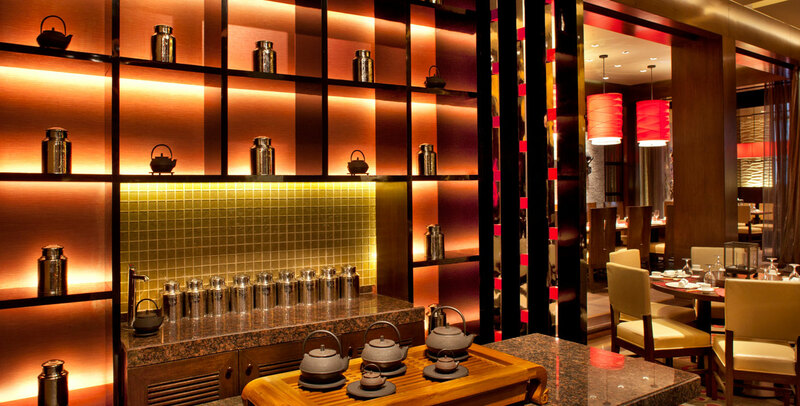 A Chinese opera mask wall flanked by flowing textured walls representing water and ribbon light fixtures overhead are featured in the bar area and direct the attention of guests towards display cooking. A luxurious private dining area is also included on a perimeter raised wood platform along with seating for small groups and features Tai Hu Spirit Rocks pinned off of raked granite walls. All of these elements combine to create a dining experience that is a dramatic culinary journey adorned with a wide range of Chinese artistic expression.